Guest Post by Noa Resheff. Noa (born 1986, Tel Aviv), graduated from the Tel Aviv University, studied Art History and French Literature. Previously assistant curator to Danna Heller and a curator at Artist Pension Trust, she currently works for Sommer Contemporary Art gallery in Tel Aviv. Nacht und Nebel (German for “Night and Fog”) was a directive Hitler set on December 7th, 1941, ordering to eliminate all resistance helpers throughout Nazi Germany’s territories. The directive’s name was derived from a common German saying that meant “in the dead of night”. In 1955, French director Alain Resnais created the film “Nuit et brouillard” (French for “Night and Fog”), a documentary about the death camps in Auschwitz and Majdanek. The film alternates between past and present, using both color and black and white footages. This was the first time actual archival footage from the camps was shown in cinema. “Nacht und Nebel” (2011) is one of two works by Dani Gal now showing in an intimate exhibition at the Tel Aviv Museum of Art. It was commissioned for the 54th Venice Biennale and is based on an interview Gal conducted with Michael Goldman—a Holocaust survivor member of “Bureau 06”, a police unit that prepared the case for Adolf Eichmann’s trial in Israel in 1961. Goldman also took part in a secret mission to dispose of Eichmann’s remains after his hanging. “On one occasion, the court projected documentary films of the concentration camps and replaced the film soundtracks with live commentary of the witnesses. This strangely took the courtroom back to the silent film era.” These words are first hints of Gal’s interest in the role cinema has in the story and in the importance of imagery in shaping history and the way we perceive it. Following his execution, Eichmann’s body was cremated. A group of police officers, Goldman being amongst them, were sent to sail offshore and scatter his ashes in international waters. Nacht und Nebel is a reenactment of the events from Goldman’s viewpoint. Similar to “Nuit et brouillard”, narrated by actor Michel Bouquet, the film is accompanied by dramatic voiceover (German actor Erik Hansen), sounding almost film noir-like. As Gal’s work often relates to collective and personal memory and their elusive qualities, these cinematic-stylistic choices are key in understanding this piece. The viewer is left to reflect on his own sources of historic knowledge – history books, the news, fictional and non-fictional films – all often part of one mix presenting evidence and fiction in the same matter. Gal’s piece is a sensitive one. He focuses on gestures and nuances, and mainly on the eyes. The importance of gaze in this context is clear – watching, seeing and especially witnessing are significant terms when discussing the Holocaust and the preservation of its memory. 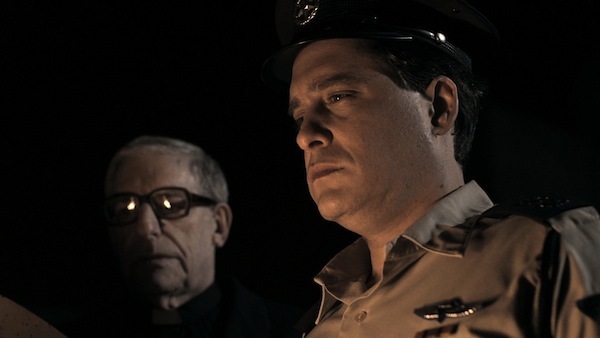 Any person living in Israel during Eichmann’s trial can recall the theatrical elements dominating its media coverage. Children would listen to live radio broadcasting of it during school breaks. Daily newspapers were constantly filled with various headlines and articles, revolving the trial. Even while catching a matinée, just before the movie started, viewers were updated of that day’s court developments through “Carmel’s diaries” newsreel. No one could escape these images. Nacht und Nebel presents the part of the story that was never over-exposed as the trial itself was. Gal has created a cinematic version of the events that followed Eichman’s hanging, which were never captured on film. It was reported only post-factum and, in radical contradiction to the trial’s media coverage, shortly and dryly. This was also the case with Osama bin Laden, whose remains were buried at sea with clear avoidance of media attention – for security reasons perhaps, but also to prevent any public discussion to take place. 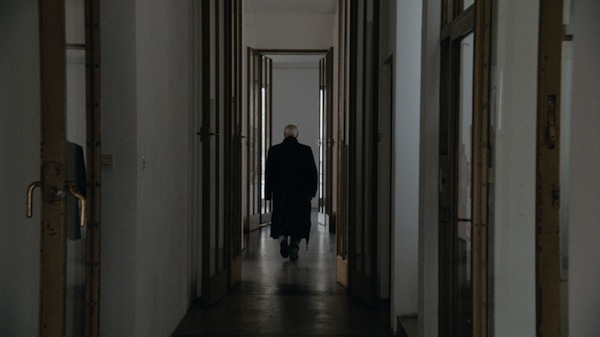 The second work in the exhibition is “As From Afar” (2013), a film telling the story of “Nazi hunter” Simon Wiesenthal’s real-life relationship with Albert Speer, Hitler’s minister of armaments and chief architect. This was obviously a very bizarre relationship and Gal’s take on the subject deals with memory and the possibility of reinventing one’s identity. The film’s soundtrack is comprised of several parts, sound being another key element in Gal’s works and cinematic language. First there are the dialogues between Speer and Wiesenthal, with a third participant in the film’s opening scene – a fictional protagonist named Cook the Magician. In this scene the three discuss a model of Mauthausen concentration camp built by Cook for an American film production company. Cook mentions the train tracks didn’t actually exist in Mauthausen (Wiesenthal was a survivor of that camp), but were added to the model after the company claimed it wouldn’t look like a concentration camp without it. Again, a remark on common imagery and little twists of truth used for creating reoccurring knowledge patterns. Speer and Wiesenthal continue walking through the streets of Vienna while conversing each other’s careers. 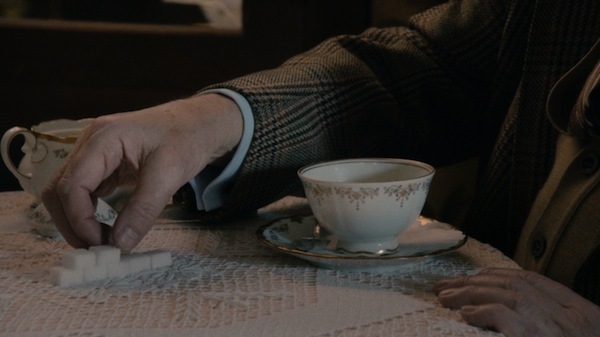 A second voice heard throughout the film is of a narrator (Nawroz Abbany) reading out lines from Austrian philosopher Ludwig Wittgenstein’s “The Brown Book”, concerning the possibility of bringing to life a memory or a sense of the past. This text, alongside conversations held between Speer and Wiesenthal, deepens the sense of surrealism that follows the film from start to finish. As viewers, we are constantly surprised by this strange story, yet at the same time aware of the multiple layers it contains – the two men are confronted with their own memories and mixed perceptions of themselves and of each other. They are trying to recreate a sense of narrative and logic in their lives and in this bond created between them. For example, at one point Wiesenthal is heard saying the following to Speer: “we all made mistakes in our youth.” These words are heard while Speer is seen washing his hands. Schumann’s “Wie aus der Ferne” (German for “As from Afar”) is being played on and off in the background, especially when the two are seen visiting Wittgenstein’s house in Vienna. This famous architectural piece was designed by Austrian architect Paul Engelmann and by Wittgenstein himself, in an attempt to, as the philosopher put it, “embody the foundations of all possible buildings”. A clean slate, everything and nothing all together. The architectural theme here is used to symbolize the process of designing identity and memory. Adding to this is the fact both Speer and Wiesenthal were architects. Gal is showing another exhibition titled “Imagined Midya” in “Zochrot”, a nonprofit organization promoting awareness of the Palestinian Nakba. Works featured in the exhibition draw from the 1978 Israeli film “Khirbet Khizeh”, directed by Ram Loevy and based on a book by S. Yizhar. The book used a fictional village to tell the story of 1948’s deportation of Arab residents from their homes. The exhibition includes three works – a new film, “Al Midya” (2014), an enlarged digital print of Mordecai Ardon’s 1953 piece “Khirbet Khizeh” and “Zen For TV And The Birth Of The Palestinian Refugee Problem”, a video installation made in 2010 referring to “Zen for TV” by Korean artist Nam June Paik. “Khirbet Khizeh” caused some controversy when its television debut was censured by then minister of education Zevulun Hammer. TV workers protested by broadcasting a black screen for the entire time the film was supposed to be aired. This part of the story is represented in Zen For TV And The Birth Of The Palestinian Refugee Problem, as an interview between Gal and Loevy can be heard through earphones as all that is showing on the screen is a flickering white line. The film “Al Midya” returns to Gal’s preoccupation with layers of reality, media and visual representation, this time through the story of Midya, a village that served as the set for shooting “Khirbet Khizeh”. Midya is located in the west bank, not far from the Israeli city Modi’in, and was left unharmed during the events of ’48. Once the Israeli filming crew arrived at the place – massive trucks with actors dressed as soldiers on them – locals were not at ease and the situation quickly exploded. After the crew’s intentions were made clear, filming started as planned. Gal returned to Midya almost 35 years after the film was made, to hear locals’ view of the story. 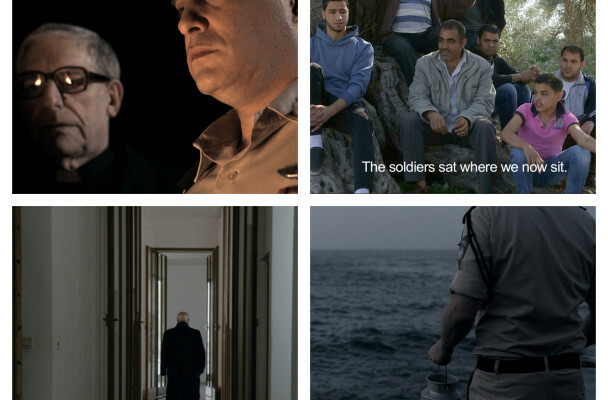 Gal’s work emphasizes how the filming of “Khirbet Khizeh” was in fact a part-real part-imaginary invasion of Midya, blurring the lines between fact, fiction and filmmaking. These three films stand as individual works, still one may find several underlying concepts they share. Gal deals with the way our concept of events is layered with information of various natures. While commenting on this mechanism, he himself takes part in it, adding yet another layer to the general mix of images and perceptions. By doing this he simultaneously makes us more critical as consumers of information, but leaves us even further baffled at the face of a complex system that is our memory and knowledge of the world and its history. 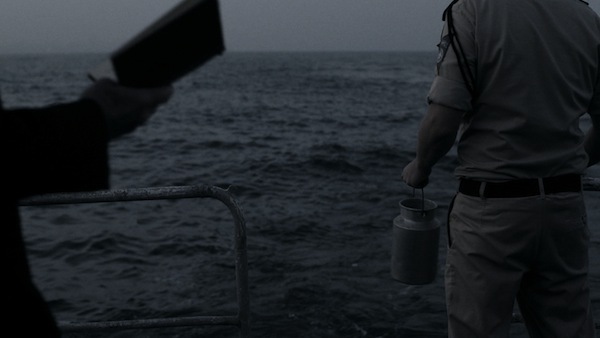 “Night and Fog/As from Afar” runs until June 21st at the Tel Aviv Museum of Art. Link to website here. “Imagined Midya” runs until August 2nd at Zochrot. Link to website here.